With the school summer holidays underway many of us will be looking forward to their family holiday abroad. Whilst the kids happily count off the number of sleeps until they board the plane some parents, like me, may be developing amongst all the usual feelings of excitement a minor undercurrent of dread. …with all of us still alive/speaking to each other/unharmed at our destination of choice. Those of you who read this post will understand exactly where I am coming from. Well, I am here to tell you from the benefit of our previous, mostly awful, experiences that there are steps that you can take to at least minimise the pain a little. I know they work. We just took them. And I cannot thank Holiday Extras enough for working with us on this and letting us try them out on our recent trip to Italy. Avoid Travelling With a Super Tired Child. Seriously. Aim to avoid this whenever possible. It will only cause you, and your fellow passengers, a world of pain. If it looks like you need to leave the house at 2am to get to the airport in time for check-in consider booking an airport hotel for the night before. This would have been near enough the case for us this trip. Instead, we booked a family room at the beautiful Cadbury House hotel on the outskirts of Bristol and instead of waking two grumpy toddlers and dragging them from their beds in the middle of the night, only to face an interminably long drive to then go and stand in a queue with them for an hour…you can picture the scene…we started our holiday a day early. After a nice morning at home we had a light lunch, hopped in the car just in time for Little Miss’ midday nap and had a toddler-tantrum free relaxed drive to Bristol. I know many, like me, imagine airport hotels as huge concrete high-rise blocks of uninspiring gloom. I could not have been more wrong. This place was, quite simply, stunning. 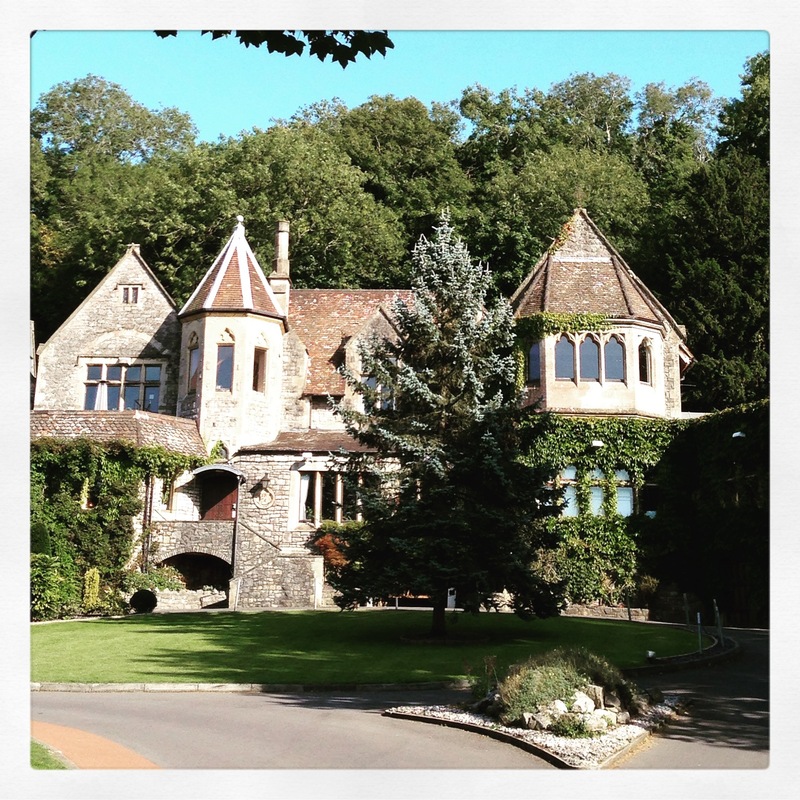 At the Cadbury House Hotel in Congresbury we had a splash in the pool, a run around the beautiful gardens and the most delicious dinner before retiring to our incredibly comfortable room for an early night. At 6am we were up and at ’em, not quite refreshed due to Little Miss’ determination not to sleep, but far more ready to face the airport than had we been up at 2am. This will save you a small fortune. Seriously. You can actually save up to 60%! Our parking was actually included with the hotel who looked after our car for the duration of our trip and arranged a taxi to the airport for us in the morning (Taxi fee not included but a quote was provided in advance). There are so many options for this though. If we had not had this included I would have opted for Meet and Greet parking. You simply drive to your terminal where a driver will meet you and park for you. No need for shuttle buses whilst trying to juggle a million suitcases onboard while simultaneously not releasing your grip on the toddlers wrist/coat/leg and balancing the baby under your arm/on your head etc. On your return you simply make a quick call when you get to the baggage claim and your driver will meet you, with your car, at the arrivals terminal. I know, I know, I know that any parent with small kids will be tutting and huffing at how ridiculous that sounds. It was on last year’s trip to visit my sister in Canada with two small kids in tow that the sheer terror that airports can instill really hit me. Mix together two small, bored, mobile kids with A MILLION moving people and a whole load of noise and I defy you not to let panic set in. I am utterly paranoid about someone trying to steal my children. Unhealthily so and as such, for me, this kind of scenario is my worst nightmare. My first tip…dress them is something really bright. Neon works well. They may look awful in the holiday snaps but at least you will spot them easily…that is if you ever let go of their wrist. Secondly, BOOK THE AIRPORT LOUNGE. It is worth every single penny. It is an enclosed space so you can actually let go of your child’s wrist. There are less people, you won’t lose sight of them. There is always a free buffet and drinks are included too so you can keep them entertained some of the time by feeding them, and maybe even relax a little with a glass of wine yourself. With Holiday Extras you can again save up to 60% of the price you would pay on the day. I wish I had thought of this before our Canada trip *weeps*. Every trip I hope and pray that the smalls might nap on the plane. It rarely happens so I have learnt to be prepared. Prior to leaving home I make sure I have several episodes of their favourite TV shows downloaded to both the i-pad and kindle ready for them to watch. Bring books. My two will almost always sit quietly for a story. I also make sure I bring a colouring book for each of them along with coloured pencils or wax crayons. Felt tips are a no go now after several items of clothing being ruined beyond repair. I have recently come across some sew-your-own puppet kits in Wilkinsons which are very good value and I think The Boy would love to do whilst travelling. So, having hopefully survived the flight and retrieved the bags/pram/travel cot etc from baggage reclaim do you really now want to try and get all of this, and the smalls, onto a train or bus? Nope, me neither. Pre-book your car hire and don’t forget to request car seats. Often these cannot be guaranteed but they will always aim to make them available. Holiday Extras will search to get you the best deal available for your needs. I would also like to point out how amazing the staff at Holiday extras are. Prior to this trip I had used them before to arrange an airport hotel both pre and post a long-haul flight with the smalls. Only I made a mistake with the booking. On realising my mistake I contacted them by phone where a wonderful lady called Alicia took my flight details and sorted everything out there and then. She also contacted the hotel to arrange a cot for Little Miss on my behalf and even request an earlier check-in than standard so the kids could get their lunchtime sleep. I cannot recommend them highly enough. Great work chaps and thanks again for making our trip stress free. Holiday Extras offers pre-booked car hire at thousands of destinations, as well as a wide choice of UK airport hotels and holiday parking. Car Hire price example: £87.61 for Citreon Berlingo, Volkswagen Caddy or similar for one week’s car hire in Italy based on five passengers with three suitcases. Price searched on August 19th for pick up on 9th October 2015 at Pisa Airport. To book, visit www.holidayextras.co.uk or call 0800 1313 777. A night’s stay at an airport hotel is the perfect way to get your holiday off to a hassle-free start. Example price: £189.00 for a family room two adults and two children sharing, with one nights’ stay and eight days’ parking at the 4* Cadbury House Hotel. Price searched on August 19th for a stay on 8th October 2015. To book, visit www.holidayextras.co.uk or call 0800 1313 777. Disclosure: We were provided with our hotel stay, parking, and car hire free of charge for the purpose of this review. All opinions are my own and 100% honest. I think we all tend to concentrate on the holiday itself and never think about the logistics of getting there. We have often booked a hotel the night before as it was easier and less stressful than travelling down on the day of the flight. I must look into booking the lounge though as it sounds a great way to relax before you jet off. Brilliant tips, travelling with kids can be so hard, can’t it?